Atiśa Dipamkara Shrijnana (Bangla: অতীশ দীপঙ্কর শ্রীজ্ঞান) (982 — 1054 CE) was a Buddhist teacher who reintroduced Buddhism into Tibet after King Langdharma had nearly destroyed it. He studied and mastered all of the traditions of Buddhism in India. After different trials to invite him to Tibet, he finally accepted the invitation and came to Tibet for the rest of his life. Some tibetan sources say he was also abbot of Vikramashila University at one point, one of the great centers of Buddhist learning after Nalanda University. He was born in the village Vajrayogini in the Bikrampur region of Bengal, currently in Bangladesh, in 982 CE. His childhood name was Chandragarbha. From a very young age he showed an extraordinary aptitude for Dharma and studied sincerely under more than 100 teachers. He received, practiced, and mastered the instructions on the Hinayana, Mahayana, and Vajrayana schools of Buddhism and was regarded highly by all the traditions of Buddhism in India at the time. 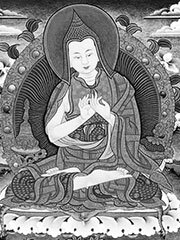 In 1011 CE, Atiśa, along with more than 100 disciples, went to Srivijaya in what is now Indonesia and became a disciple of Dharmakirti, known in Tibetan as Serlingpa Gser-gling-pa, to receive instructions on Bodhicitta. Atiśa stayed with Serlingpa for 12 years. He then returned to Magadha where he met great Buddhist scholars who all acknowledged his superior knowledge and scholarship. In the 11th century, the king byang-chub ‘Od invited Atiśa to come from Bengal to Tibet, in order to help him raise money to build a large statue of Manjuśri. Atiśa composed his famous bhuddist text «bodhi path pradipa»-Lamp for the Path to Enlightenment, in tibetan it means «Byang chhub lam gi rdon mey». It is a short text on lamrim, the stages of the path to enlightenment. Dromtonpa, the principal disciple of Atiśa kept the complete legacy of Atiśa and this became later known as the Kadampa (Bka’-gdams-pa) tradition of bhuddism. This was later revived by the Tibetan teacher Tsongkhapa (Btsong-ka-pa), the founder of the Gelug (Dge-lugs) tradition. Since that time the Kadampa school of Atiśa is named Old Kadampa and Tsongkhapas Gelug school is named New Kadampa. Firstly the tradition on the instructions on Bodhicitta were kept very secret. In Tibet Atiśa passed it only to his main disciple Dromtonpa. Later the instructions became known in Tibet as Training the Mind (Tib. lojong) and were integrated and emphasised in all four tibetan buddhist schools. Swarnadvipa( ser ling) is generally taken to mean insular Southeast Asia. In Atiśa’s time the area was dominated by the great empire of Srivijaya which was known as a seat of Buddhist learning. Vimalaratnalekha is a Sanskrit letter to Nayapala, king of Magadha. Charyasamgrahapradipa contains some kirtan verses composed by Atiśa. After staying for thirteen years in Tibet, Atiśa died in 1054 CE in a village called Lethan, near Lhasa. The site of his last rites at Lethan has turned into a shrine. His ashes were brought to Dhaka, Bangladesh on 28 June 1978 and placed in Dharmarajika Bauddha Vihara.